I have a certain interest in old recipes for sundaes and sodas from the soda fountain era. Along with the familiar chocolate sundaes and banana splits that we still find in today’s restaurants, you find more unusual confections such as a Rose Bud Sundae with rose dressing, a Grape Sundae Malted with grape juice and malted milk, and a Fruited Creme de Menthe Salad with lettuce leaves, vanilla ice cream, fruit salad, and creme de menthe syrup. Clam juice, 1 1/2 fl. oz. Milk, cold, 2 fl. oz. Add a pinch of salt and a small amount of powdered white pepper to each glass. Obviously this is not a sweet dessert. Anyone dare to try it and report back? I don’t think I can do it. I have seen quite a few recipes for hot drinks with clam bouillon, milk or cream, and hot water (see the old ad below), and that doesn’t seem as weird—it just seems like soup. But the cold, carbonated clam soda? 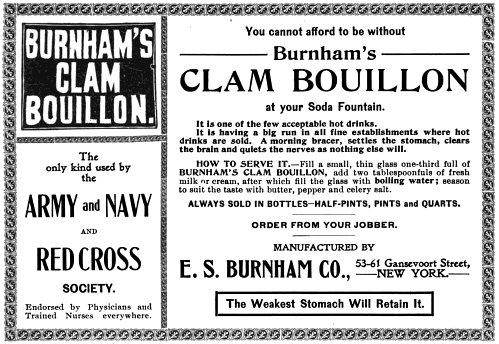 Clam bouillon advertised in The National Druggist, 1900. Back in January I discussed the Golden Rod Cake and the pan used to bake it. We did find several recipes, but were left wondering about what the cake was supposed to look like, and about the origin of the name. I have since found a tiny bit more information about this elusive cake. Beat the yolks of six eggs very light; gradually beat into these half a cup of granulated sugar, then two tablespoonfuls of orange juice. Lastly, add half a cup of sifted flour, sifted again with a level teaspoonful of baking powder and a few grains of salt. Put the mixture into Waldorf Triangle pans and bake in a moderate oven. As soon as the cakes are turned from the pan cover the sides with boiled frosting and sprinkle with fine-chopped pistachio nuts. The title of the early Boston Cooking School recipes seems to be pretty clear that this is a recipe for Goldenrod Cake that can be used to make Waldorf Triangles. Other early recipes, however, do not mention the pistachios, and frequently mention orange icing. Beat the yolks of six eggs till light; gradually beat into these one-half cup of sugar, then two tablespoonfuls of orange juice and one-half cup of sifted flour, sifted again with a level teaspoonful of baking powder and one-fourth teaspoonful of salt; bake in small cakes and cover with orange icing. This is the same as the BCS “Goldenrod Cake for Charlotte Russe Moulds and Waldorf Triangles” and the later American Cookery “Waldorf Triangles” recipe, with one exception — the end. No mention of boiled icing sprinkled with pistachios, just orange icing. Could the pistachios be the defining characteristic of Waldorf Triangles? One of the BCS recipes doesn’t mention them either. Perhaps the cakes are Golden Rod Cakes if they have orange icing (or none?) and Waldorf Triangles if they have pistachios. The recipe in 365 Orange Recipes: An Orange Recipe for Every Day in the Year is called “Goldenrod Cake” and says “Bake in goldenrod pans and when cold ice with the following Icing,” going on to describe an icing made from orange rind, egg, sugar, water, orange and lemon juice, and “sugar to make as thick as fondant.” The icing is then colored orange. There are a couple more references to these recipes that could add clarity to the situation, or perhaps just muddy it further. 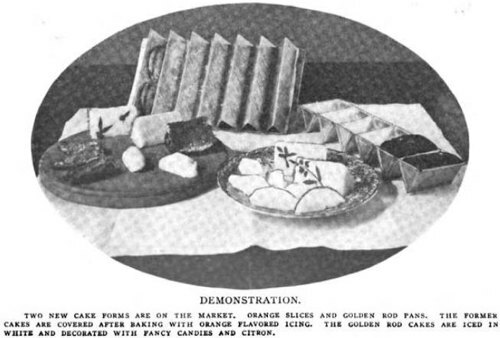 Prepare the goldenrod cake mixture given on page 91 of August-September, 1904, issue of the magazine. Bake this in goldenrod pans (it will take two pans, each holding six triangles). When the cakes are baked, cover the sides with confectioner’s frosting or with fondant, then sprinkle with blanched pistachio nuts, chopped fine. The implication here is that Golden Rod cakes become Waldorf Triangles by the addition of frosting and chopped pistachios. Waldorf Triangles or Golden Rod Cake. Well, there’s the orange icing. No pistachios this time. And the title calls these either Waldorf Triangles or Golden Rod Cake, implying that they are alternate names for the same thing. The text reads: “Two new cake forms are on the market. Orange slices and Golden Rod pans. The former cakes are covered after baking with orange flavored icing. The Golden Rod cakes are iced in white and decorated with fancy candies and citron.” Here the Golden Rod cakes aren’t the orange ones, but they don’t have pistachios, either. No reference is made to Waldorf Triangles. 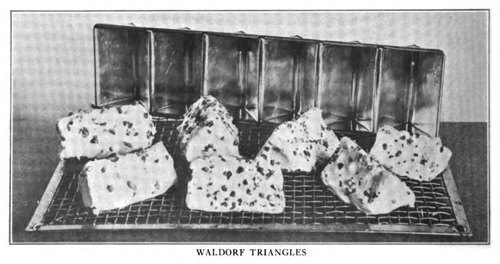 My thought, after all of this, is that Golden Rod/Goldenrod Cakes are probably the basic triangular cakes, usually iced with orange icing (and perhaps frequently conflated with the Orange Slice cakes which had a slightly different pan, but could also be made in the Golden Rod pan), and that Waldorf Triangles were a variation (presumably originating at the Waldorf Hotel?) that had pistachios and were not orange. This is really only speculation, subject to change as I find more information. I look forward to finding more versions of these recipes and researching this further, and to possibly trying the recipe one of these days. I’m also looking forward to finding one of the darn pans! No luck so far. 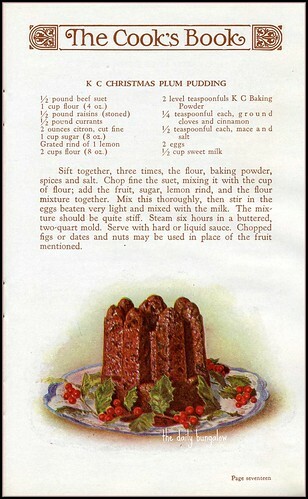 Click on this image, then click All Sizes, to see a larger copy of this 1930s plum pudding recipe. Scan by Daily Bungalow. Christmastime is the perfect time to investigate old-timey recipes. Finding time to cook them is another story, however. But I can still look for ideas. I’ve never actually had a plum pudding. I know that they aren’t common in the United States, or at least, not in the Pacific Northwest, where I live. Is it that the recipe is old-fashioned, or is it just that it was never popular in this country? Looking for something Christmasy, I stumbled on a book with the substantial title: Dr. Chase’s Third, Last and Complete Receipt Book and Household Physician, Or Practical Knowledge for the People: From the Life-Long Observations of the Author, embracing the Choicest, Most Valuable and Entirely New Receipts in Every Department of Medicine, Mechanics, and Household Economy; including a Treatise on the Diseases of Women And Children. In Fact, The Book for the Million. With Remarks and Explanations which adapt it to the Every-day Wants of the People, Arranged in Departments and most Copiously Indexed, by A. W. Chase, M. D., the “Memorial Edition” published in 1891, after Dr. Chase’s death. Dr. Chase includes six different “receipts” (recipes) for plum pudding, and devotes space to many other different puddings, too. A whole chapter in the book is devoted to puddings, including such odd concoctions to our eyes as Pop-Corn Pudding, Salt Pork Pudding, and “Hunter’s Pudding, Boiled—Will Keep for Months.” There is much Resurrected Recipes fodder to be found here, though I imagine we will stay away from the Salt Pork Pudding. Be sure after this that you properly mix. Then boil for eight hours just as hard as you can. Christmas Plum-Pudding, No. 6, Old Style.—Stone 1 1/2 lbs. of raisins, wash, pick and dry 1/2 lb. of currants, mince fine 3/4 lb. of suet, cut into thin slices 1/2 lb. of mixed peel (orange and lemon), and grate fine 3/4 lb. of bread-crumbs. When all these dry ingredients are prepared; mix them well together, then moisten the mixture with 8 eggs, well beaten, and one wine-glass of brandy; stir well, that everything may be thoroughly blended, and press the pudding into a buttered mould; tie it down tightly with a floured cloth, and boil 6 hours. On Christmas day a sprig of holly is usually placed in the middle of the pudding, and about a wine-glass of brandy poured round it, which, at the moment of serving, is lighted, and the pudding thus brought to the table encircled in flames. Remarks.—With half-a-dozen plum-puddings none need go without a Christmas day, certainly. The only point that seems to me unreasonable is the long boiling, 8, or even 6 hours, which appears to be more than is needed. A circle of three ladies, to whom I referred the matter, gave it as their judgment that 3 hours would be sufficient. Let English people stick to the old custom, but Americans will find that from 3 to 4 hours will cook them perfectly. [See the Paradise Pudding below, which is only to be boiled 2 hours.] A wine-glass, at least, of brandy is almost universally put into the sauce upon Christmas occasions. I probably won’t make these, as suet is one of those things that I don’t eat. (Maybe we can talk Kristen into it…) I challenge you all to try one of these recipes, and let us know how they turn out. Published Monday, January 1, 1900 in the San Francisco Call. Courtesy of Indiamos. Photo by Vincent van Dam. Those who know me know well that I love citrus flavors. Particularly citrus desserts. Lemon cake with raspberry filling. Lemon curd. The elusive “Gold-n-Sno Cake.” So when browsing late 19th century magazines, the phrase “Orange Omelet” leapt out at me. I had to try it. Oranges, sugar, and eggs — sounds lovely. When do we eat? You can still find sweet orange omelets here and there, but they are decidedly old-fashioned. 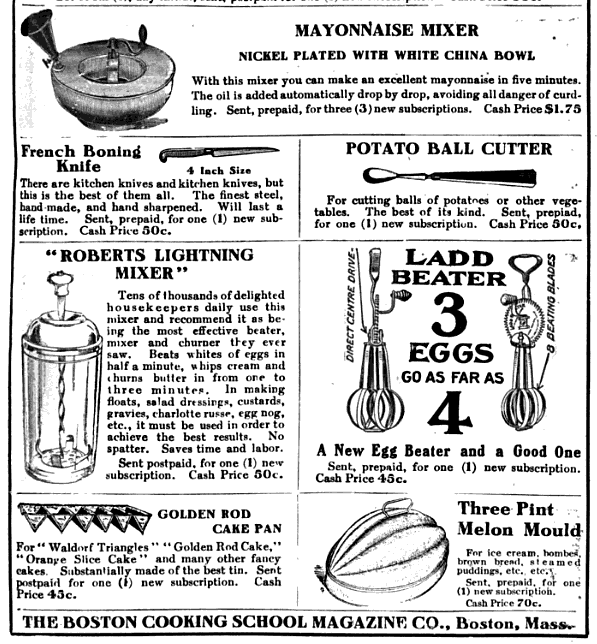 None of my modern cookbooks contain one, but they are frequently found in classic late 19th/early 20th century cookbooks such as Fannie Farmer’s Boston Cooking-School Cook Book, The Settlement Cook Book, and Mrs. Lincoln’s Boston Cook Book. Ruffians and brazen harlots? Well, call me a brazen harlot, then. Bockenheim’s recipe is not terribly different from those that followed about 100 years ago. Make an omelet of four eggs, the yolks and whites beaten separately, four tablespoonfuls of sugar, a pinch of salt, grated rind of one orange and three tablespoonfuls of orange juice, fry. The instant the omelet is cooked, spread the sliced oranges on it and fold or roll the omelet. Serve very hot. Take the whites and the yolks of four eggs beaten separately, very thoroughly. To the yolks add three tablespoonfuls of sugar, not more than a pinch of baking powder, two tablespoonfuls of flour, four of milk, one tablespoonful of orange juice. Pour into a heated saucepan, then the whites, fry rapidly, fold, serve very hot with raspberry jam. A delightful luncheon dish. Four eggs, five tablespoonfuls of sugar, a little salt, two oranges, two tablespoonfuls of butter. 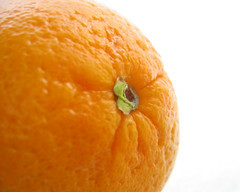 Grate the rind of one orange on one tablespoonful of sugar. Pare and cut the orange in thin slices and sprinkle with two tablespoonfuls of sugar. Beat the whites of the eggs stiff, add the sugar and orange rind, salt, beaten yolks, and two tablespoonfuls of orange juice. Put butter in a hot omelet pan and pour in the mixture. When it begins to thicken well, spread over the sliced oranges (no juice). Fold omelet from the side of the pan over the sliced oranges, turn on a hot dish; put in the oven two minutes, and serve immediately. Beat the yolk of the egg and add the orange rind and juice. Add the sugar. Fold in the beaten white and turn on heated buttered pan and cook until set. Serve with powdered sugar. I tried the last recipe yesterday — it’s simple, and serves one, which is nice when I’m experimenting. Watch this space tomorrow for the results.